Amazon's Kindle e-book reader and Apple's iPad tablet have a lot more in common than you'd think. Both devices have sparked a revolution in mobile computing, are selling like hotcakes, and brought e-books to the masses. At the last count, Apple sold three million iPads since April this year, and is expected to exceed 10 million devices sold by the end of 2010. 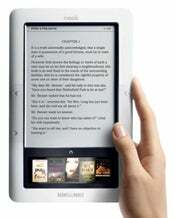 Market research firm The Yankee Group also forecasts that 6 million e-readers will ship in 2010, and that number is expected to grow to 19.2 million by 2013. But how did we get to this point? First, there was the Amazon Kindle. The original Kindle came in at $399 back in 2007 and sold out in under six hours. Two iterations later, the third-generation Kindle starts at $139 and is Amazon's most popular product ever, the company announced on Wednesday. The retailer never gave exact numbers of how many Kindles it sold. Believe it or not, consumers have to thank Apple for the $260 price difference between the original Kindle and the Kindle 3. As with the mobile industry (see iPhone, iPhone 3G, iPhone 3GS and iPhone 4), Apple has been the disrupting factor in the uptake of black and white e-ink e-book reading, with the iPad. The iPad, priced from $499, offers all the functionality of a Kindle, alongside a large colour touchscreen, and a 10-hour battery life. Apple's own iBooks Store rivals Amazon's Kindle store, and the multipurpose functionality of the iPad drove down the price of the single-purpose Kindle, shredding almost $300 off the Kindle price tag. A recent survey from Marketing and Research Resources found that 40 percent of those questioned now read more on their Kindles and iPads than they did with print books, according to the Wall Street Journal. Forrester Research estimates around 11 million Americans will own at least one digital reading device by the end of September, and as prices for e-reading devices fall, Amazon says people buy three times more books on their e-readers than they would with printed products. Since e-books are cheaper to produce and distribute than printed books, they should cost less, but they don't. Books from electronic bookstores from the likes of Amazon, Barnes & Noble, or Apple are still more expensive than their printed versions. The average paperback sells at around $10, while its electronic counterpart retails at $12.99. For a casual reader, e-book reading might not make economical sense, as long as they have to pay for a device like the Kindle and then pay extra per book as well. Although e-ink e-readers prices dropped thanks to the iPad, Apple's iBooks Store takes the blame for increases in e-book prices. The Cupertino company introduced the agency model to the e-books market, where the publisher can set its own prices, while Apple takes a cut out of the final selling price. Amazon used to sell all its books at a set $9.99 price, but publishers forced the retailer to increase its prices, following Apple's decision to adopt a different, more profitable model for publishers. As analysts predict huge sales and consumers rush to buy e-readers and tablets, the market is in no short supply of reading devices. In the same category as the Amazon Kindle, you can get a Nook from Barnes & Noble or a Sony Reader, all with prices under $230. If you prefer to read e-books on a tablet, the Apple iPad is your best bet so far, starting at $499. Competitors like Samsung and Motorola are working on their own Google Android-powered tablets, but they are not out yet. Alternatively, if you want a smaller tablet, you can take a look at the Dell Streak. Follow PCWorld (@pcworld) and Daniel Ionescu (@danielionescu) on Twitter.